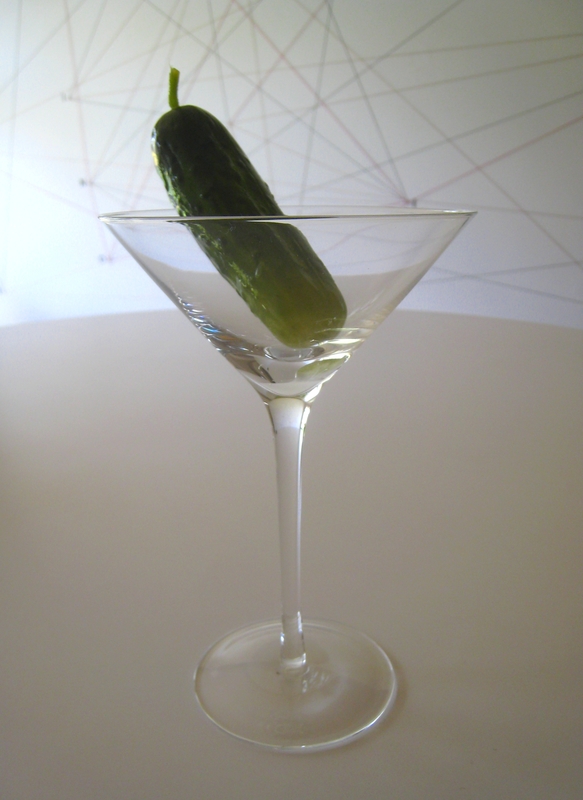 I was taken aback by my failure to find a worthy pickle cocktail. I love pickles to an extent that should embarrass me. I could eat pickles every day of my life — especially classic kosher half-sours. I can’t explain that, in a Freudian or even middlebrow New Yorker way; it’s just a kitchen fact, and I have no expectation that constant or even random readers would share my pickle jones. Perhaps it’s genetic, like green hair or being gay. But how could you not crave tumid, crunchy, garlicky off-green pickles? Cut them up into dainty pieces if they’re too drippy and phallic for polite you. And there’s no need for worn-out nickel-a-shtickel sentiment. In my private kingdom, Pickle is All. National census reports are still coming in, and if you want to see blindness in action, watch the way that certain acquaintances of yours and mine will not admit to themselves or anyone that they’re now part of a numerical minority. Fellow caucs, I won’t say any more. My solution? Brine. From now on, we should limit ourselves to a pickle census. Pickles can divide us, of course: Ask ’50s Brooklyn “kids” what they think about gherkins or frilly bread-and-butters and watch those faces crinkle. Yet cucumbers in any brine are still just a sliver of pickle possibility. Widen your vegetable eyes and you’ll see that pickles of all persuasions — Indian, Korean, Mexican, plus our own farmstand jewels — may knit the world’s antagonistic parts into one harmonious pickleverse. There’s something irresistible about a pickle. To toast that Disney concept, I tried to reproduce or even create, with brine or bits of the thing itself, widely appealing “picktails.” I attempted this not just to provide recipes that would set party-tongues wagging, but to offer “if I can, you can” examples. Trouble is, my picktails tanked. Not completely, of course, but any drink you don’t want every time you want a drink is a no-go, a one-nighter at best. Still, read on. There’s an “almost” you may enjoy. The main reason my picktails failed is personaI. I am anti-vodka. A straight shot or iced, fine, but it’s not a full-deck player in a cocktail, just an alcoholic solvent. An honest bartender will divulge that he or she can mix any kind of brine — half-sour, caper berry, high-rent Brooklyn anythings (there are two links here) — with Smirnoff or Grey Goose or Black Swan and get a salable “dirty” drink. Waiter, could I see the brine list? But what you taste at first is merely spirit-diluted pickle juice, a mildly spiced embalming fluid, which, after a few gulps, results in a salty hiccup, the drink and the snack muddled in one pricey dose. I will not discuss picklebacks. Google them. Then, unless you are an NYU undergrad looking for some Park Slope action, avoid them. No Worcestershire; no extra salt, and be careful with the amount of your choice of pepper till you taste at the end; lime and lemon juice, or lime only. Two jiggers of gin, a half jigger of brine. During summer, use diced fresh tomatoes, skin and all, mash together, then ice and stir. The rest of the time, use the usual juice. Yes, I’m in my Elizabeth David “some of this some of that” mode. So I tried substituting brines for vermouth in brinetinis. Do dry sherries sub for vermouth? Yes, they’re starchy but elegant. Sakes? Girly, yet intriguing. Brines? Sour and alarming, unless you go eyedropper dry. And that result is still not a new-cocktail handshake, friendly if challenging, a relationship possibility. Particles of brine smudge actually laughed at me through the glass. Then, with the pickleback in mind, I went the way of the Manhattan. Rye, bourbon, or Irish; brine; bitters: the Lower Manhattan. I was hopeful, because the wrong section of my brain, not the instinctive palate-part, was working. That’s all I shall say about that. A long-loved culinary fantasy proposes that really good recipes combine ingredients so that their individual flavors and qualities disappear into a big, fat something else. I treasure that concept, especially when applied to elemental categories such as cocktails. But even the French, who tried to get others to believe that they and no one else could perform this magic, know that recipes are more complicated. No matter what you force a single ingredient to live with or how you convince it to change its shape, it will always find a way to hold on to its origin — even in the form of flavor ghosts. In fact, we seek good ingredients because they never entirely give up their ghosts. So your poor, put-upon palate, faced with a haunted mansion of competing spirits, does its best to be welcoming to a madhouse. The argument between the newbie dish and its ingredient ghosts goes back and forth, and that ongoing confusion is what we taste. But not in a brine cocktail. There, the pickle dictator has his way. Thanks Jeff for cluing us in to your creative picktails. Your Briny Mary brings back memories of the First International NYC International Pickle Festival, where I was charged with distributing packets of Twang. More than one visitor suggested rubbing the pickle-flavored salt on the edge of a bloody mary glass (like margaritas or nigori-sake which is traditionally served in a cedar box with a pinch of salt atop one corner). Perhaps you are using the wrong brine. I live close (too close) to the best pickles in the world, Fickle Pickles, in Gruene, Texas. Besides here, I have lived in Colorado, Massachusetts and London (where the pickles are heinous). Here is the link to them – http://www.ficklepickles.com/. They ship. I can only buy the small jar (extra spicy) because I have no control. Give your cocktails another try with Fickle Pickle brine. I am going to apologize to you ahead of time for your new pickle addiction. I am very, very sorry. Don’t buy them all – leave some for me.